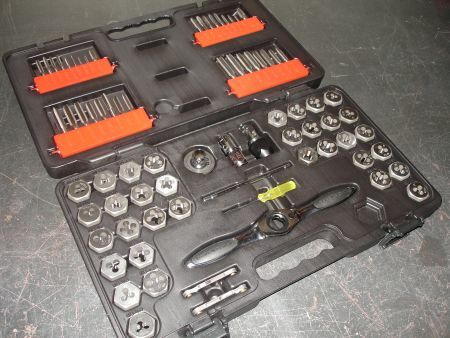 A good tap and die set is an absolute must have for any serious Toolmonger. They’re necessary for metalworking, but they’re also incredibly useful in more common situations as well — like, for exampel, cleaning out or straightening threads that (somehow) got mangled or making a bolt out of some loose stock when you don’t have the right size handy. Because these are such simple tools, we haven’t really seen a lot of innovation in tap and die sets — until we came across GearWrench’s unique ratcheting T-handle. It’s a great idea, and it’s packaged in a set that performed well in the Toolmonger shop. Read on past the jump for our hands-on experiences and lots of pictures. Note: Click on smaller photos for larger ones. This 75-piece set comes in a standard molded plastic case designed to hold all the parts in place for easy location later. 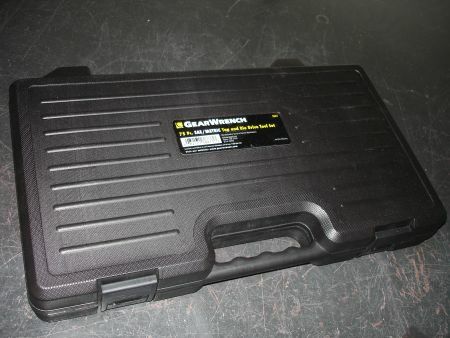 As with many of their other tool cases, GearWrench doesn’t skimp on the latches. Unlike manfuacturers who apply a simple plastic hinge — which inevitably fatigues and breaks — GearWrench gives you a metal hinge which should last for some time. Inside the case you’ll find the taps on the top in plastic holders which rotate up for easy access, the dies in snap-in molded plastic cradles in the bottom, a foam divider to help hold everything in place, and a single 8-1/2″ x 11″ sheet of folder paper with a conversion chart to help you determine which drill to use with which tap. The star of the show, however, is GearWrench’s ratcheting T-handle, which can be found front and center in the bottom half of the kit. With two nice thermoplastic rubber grips on the ends, this wrench features a grip-the-socket-from-the-outside ratcheting system identical to those found on GearWrench’s Pass-Thru ratchet set. In fact, the 3/8″ drive sockets and extensions from other GearWrench sets will fit into the T-handle. As this set includes both metric and SAE taps and dies, GearWrench includes both metric and SAE thread gauges. Also included are all the tools necessary to adjust and maintain the kit. Read on to page two for our in use experiences. If you buy “real” HSS split adjustable dies (which adjust so you can get a thread dead on) and “gun” or spiral fluted taps (which eject the chips out the front or the back of the hole depending on the style, so you don’t have to back up every couple of revolutions), you will never go back to the rethreading style in the gearwrench set. I’m sure they’re good, but you can do a lot better if you are going to thread a lot of holes. Heck, look into fluteless or form taps as well – they don’t cut but cold forge the threads! Great for tiny sizes as they’re a lot stronger. I wish these came with the right complement of drills. Bill: This is a great reason to own a decent 115-piece drill set. You’ll hear some argument that you should never buy anything but the best drills available, but I’ve always believed that you’re better off having a lesser bit that’ll work for what you need right now than having just a few great bits — that are useless because you don’t have the size you need. You can find a decent 115-piece (all lettered, numbered, and fractional sizes) for under $100 (and sometimes as low as $50). At those prices they won’t last forever, but you can always replace the ones that fail with better bits; they’re the ones you’re using a lot anyway, right? 1) The ratcheting action is not a reason to buy this set. I have a set of ratcheting tap wrenches and 99% of the time I use them in the non-ratcheting mode. Every time you have to back the tap out you have to switch modes, gets to be no fun very fast. 2) It is much more economical and practical to buy only the taps and dies you will actually use. Probably 75% of these taps will never be used. Buy what you need when you need it and buy a quality tool, you’ll be better off in the long run. I managed to pick up the 5 piece handle set at Sears a few weeks ago for $30. After trying it a few times, I love it! I do find it a bit annoying to back out the tap due to the ratcheting mechanism, but that’s something I could live with since the overall usage is a wonderful experience. they’ll have you suicidal suicida. Huda Swithun. Looks like the KD 3885 40 pc tap & dye set at http://www.denlorstools.com/ GearWrench has really came out with some neat stuff lately. Woops I it’s a 75 piece set that’s the KD 3887. I’ve had this kind of tool in my house, i bought it 6 months ago and till now the durability and the quality remains. So far this is the best tool i have in my house and i think it is worth your paying for….